There were not one but two 5G Wi-Fi hotspots shown off yesterday from Inseego and Netgear. 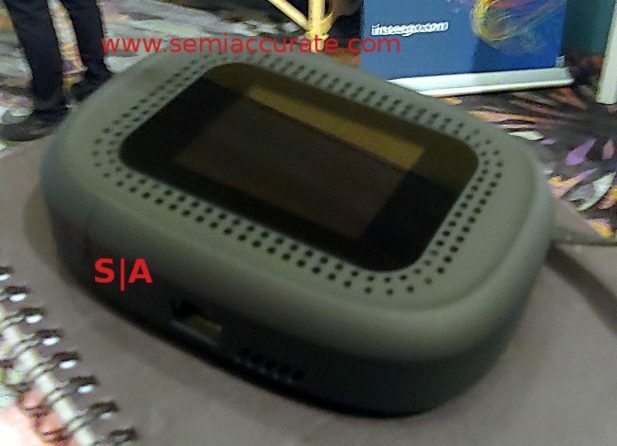 They weren’t prototypes either, as SemiAccurate said yesterday, the venue was lit with 5G and it was running the demos. Inseego had the first 5G hotspot we saw and it was running on the Verizon network. If you take a high end LTE hotspot and add 28GHz mmWave functionality, you get the new MiFi 5G NR. As we keep harping on, this was a live unit running on commercial frequencies with real workloads, in this case a telemedicine demo with Columbia University. There are a few interesting bits here that you can’t really see in the awful pictures I took. On each side there are air intakes and the decorative holes around the screen are for exhaust. This, and the Netgear box, is an actively cooled hotspot with two fans. Why? Throughput mostly, the Qualcomm X24 modem itself is capable of ~2Gbps and the X50 adds in more bandwidth, quite possibly both simultaneously. We will have to wait for the exact specs of the device before we know for sure but 2Gbps sustained is the minimum for this class of device. On the output side there is obviously Wi-Fi (6/AX) but if you want real speed you need to go with the USB-C port. It is 3.1 so 5Gbps but that should be enough for most. More helpfully the Inseego router also has an Ethernet port which should make life saner for power users and all the ports and Wi-Fi can be lit up simultaneously. With a 4400mAh battery good for 10+ hours and all ports lit up, now do you see why active cooling is a good idea? 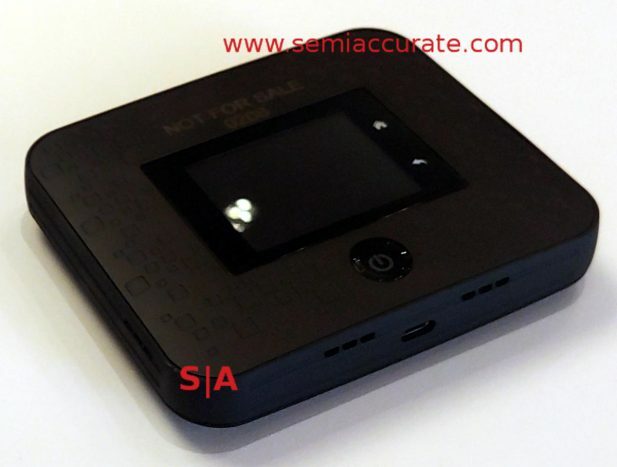 The Netgear Nighthawk 5G is similar to the Inseego router in many ways, it is a Qualcomm X24/X50 based 5G hotspot that operates on the ATT 39GHz bands. It too uses LTE Cat 20 as the base frequency and the mmWave bands on top of that for extra throughput. Unfortunately Netgear did not include an Ethernet port on the Nighthawk 5G so if you want speed you need a device with a USB-C port. As you can see above, the Nighthawk is a lot flatter and a bit wider than the Inseego router. It also lacks the thick rubberized case but does have several air holes indicating active cooling. Other than that these two devices do more or less the same thing, take the highest end LTE modems available on the market and add mmWave capabilities on top. Even without those high bands there would be a lot to like about both devices, either one should provide more than adequate speed for most users.